I received a jar of Plum Sauce with my Try the World subscription. I wanted to make something easy and not too sweet. I looked at several recipes and came up with this. I skip the usual step of marinating the chicken, just to make it quick. It turned out great and we've made it several times. Try the World is a subscription service that sends you a box of food items from a featured country once a month. I had been wanting to try it for a few years now. It seems that after I subscribed, they changed it to where they sometimes just send out a mix of stuff. Right now, I can't recommend them, but we are still having fun with the items that they send us. Lightly season chicken with salt and pepper. Line plate with paper towels. Heat wok. Once hot, add 1 tablespoon of the oil. 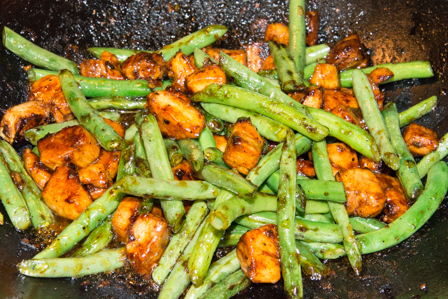 Add green beans, stir-fry for 3 minutes. Remove green beans using slotted spoon to paper towel lined plate. Add 1 tablespoon oil to the wok. Add chicken. Stir-fry for 5 to 6 minutes, or until chicken is cooked. Add mirin and soy sauce. Stir-fry for 30 seconds. Add garlic and ginger. Stir-fry for 30 seconds. Add green beans. Add Plum Sauce. Stir-fry for 30 seconds.